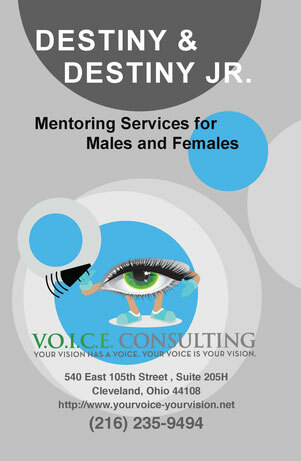 Mentoring - Website of voiceconsulting! Mentoring services are delivered in 3 to 4 phases, which we refer to as cornerstones of mentoring success. Mentors undergo a rigorous two-week training process and must be willing to complete an application and Federal BCI. At the present, the majority of our mentors are college students. All mentoring services are one-on-one, with mentors trained in youth development and mentoring relationships. V.O.I.C.E. believes that there are primary cornerstones to mentoring success. Each cornerstone has a major focus in the pairing process of mentors and mentees, building the relationship between the mentor and mentee, and allowing the mentee to develop and understand their individuality, strengths, challenges and aspirations in a safe, supportive environment. DESTINY, is designed for high school youth 14-18 years of age. 1. Understanding who you are and what you stand for. 2. Understanding and developing principles of a winning future. 3. Learning how to define your personal success. DESTINY JR., is designed for middle school youth, 11-13 years of age.